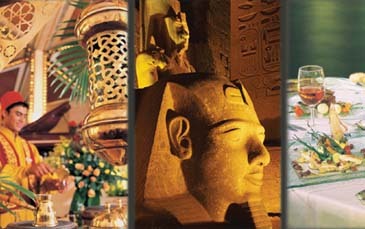 From May 3 to May 15, 2006 the COEX InterContinental Seoul's Lobby level restaurant, The Brasserie, will be hosting two chefs from Egypt. Chef de Parti. Gawad Habib and Chef de Parti. El Maghraby have prepared a healthy, delicious selection of traditional cuisine to add a little flavour to the generous buffet selection available at The Brasserie. Arabic cuisine does not include the use of artificial colors or flavors preferring instead to bring out the natural flavors of each dish's ingredients. Chef Habib and Chef Maghraby recommend that guests try their lentil soup with vermicelli (lentil beans, along with Korea's kimchi, have been designated one of the world's five healthiest foods) or perhaps one of their traditional salads such as fattouch or babaghanough or a main dish like kebab Halah (lamb), okra stew with lamb, molokhia with chicken, stuffed pigeon or stuffed vine leaves with lamb. For dessert om ali, a sweet pudding is recommended.